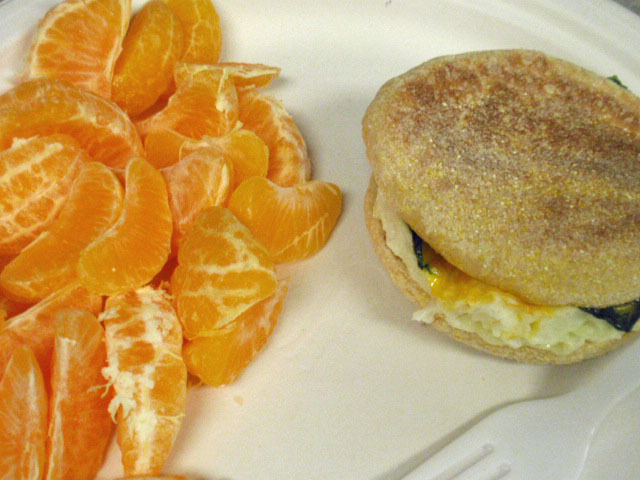 I realized I never made my wonton cups for my egg white spinach breakfast, so quicky subbed in an english muffin egg/spinach sammie and 3 clementines on the side – they were tiny! I forgot my good camera at home, so please bear with the pictures today. 😀 Breakfast comes in at 7 points. 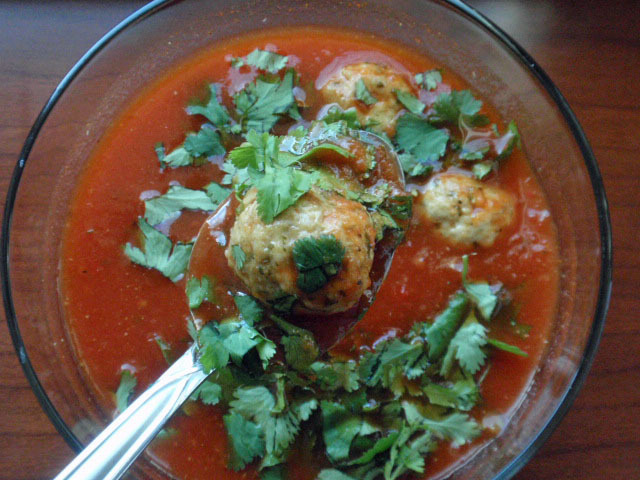 So I had Kerstin’s Indian Spiced Mini Meatball Soup (Printable Recipe) on my menu, but I did have to make a couple substitutions based on what I had on hand. You all know I hate ground meat – so if I need ground chicken I just grind it myself in my food processor. I also omitted the onion, oil and tumeric (which is why mine is so red and not orange like her version), and Pam fried the meatballs instead of baking them. I just cooked them enough to brown on the outside, and then after the soup cooked for 30 minutes and I pureed the soup base, just added the balls back in and let them simmer for 5 minutes to cook through. THIS IS A GIANT SERVING! 2 1/4 cups broth with 10 meatballs – 348 calories, 11.7 fat, 17.25 carbs, 1.45 fiber and 36 protein, or 8 WW points. I also added 1/2 cup cilantro to the meat mixture. To make the meatballs, heat oven to 375˚F. Place ground turkey, egg, panko, garlic, ginger, cumin, fennel powder, cayenne pepper, and salt in a large bowl and knead with your hands until well mixed. 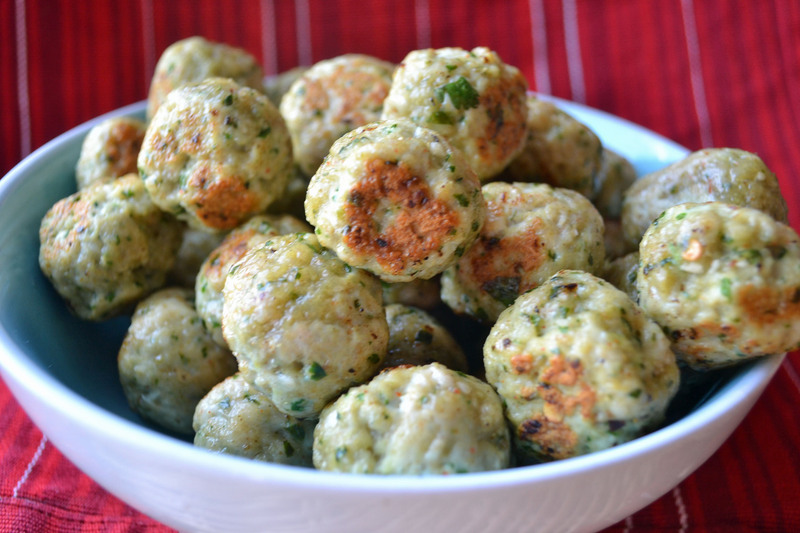 Shape into 50 mini meatballs and place on a large cookie sheet. Bake at 375˚F for 12-14 minutes or until cooked through and no longer pink in the center. I put all the meatball ingredients in my food processor and pulsed until it got to my desired consistency. Since this made 4 servings I made 40 meatballs. In batches, I browned the meatballs just until all the sides were browned, then added them back to the soup at the end to finish cooking. To make the soup, heat canola oil in a large stockpot over medium high heat. Add onions and sauté 5 to 7 minutes or until tender. Stir in garlic and sauté 30 seconds; stir in coriander, cumin, ginger, garam masala, cayenne pepper, and tumeric and sauté an additional 30 seconds or until fragrant. Add chicken broth, tomatoes, and roasted peppers, and bring mixture to a boil. Reduce heat to low, cover pot, and simmer for 10 minutes. Use an immersion blender to puree soup until smooth or place batches in a blender and process until smooth. Stir in apple cider vinegar and salt. Mix in cooked meatballs. Makes 4 servings. 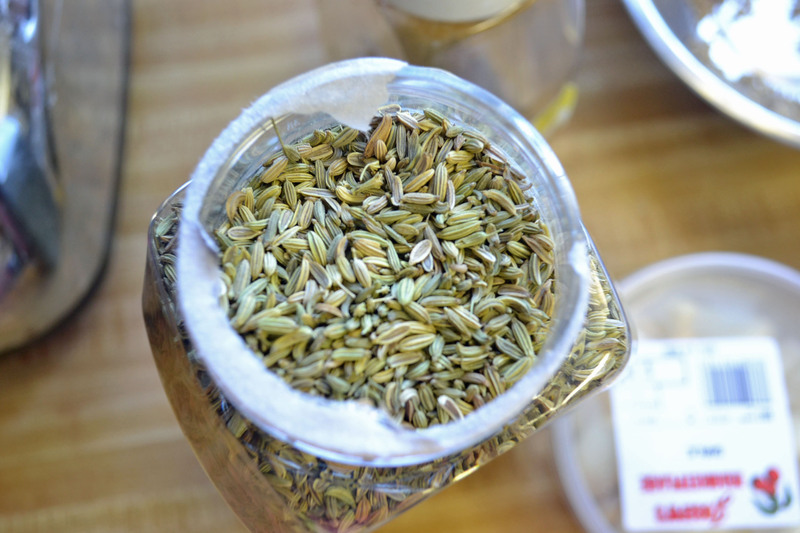 I had actually never used fennel seeds before – I am not a huge fan of fennel itself, but LOVE fennel seeds. I bought this 16 ounce container for $3.50, and this will last me a long time – I just ground up the seeds in my coffee grinder that I cleaned out. This is the best soup you’ve ever given me! The only thing I love about it being the end of January? It’s light out when I leave the office! Update – just wanted to post my dinner pics. 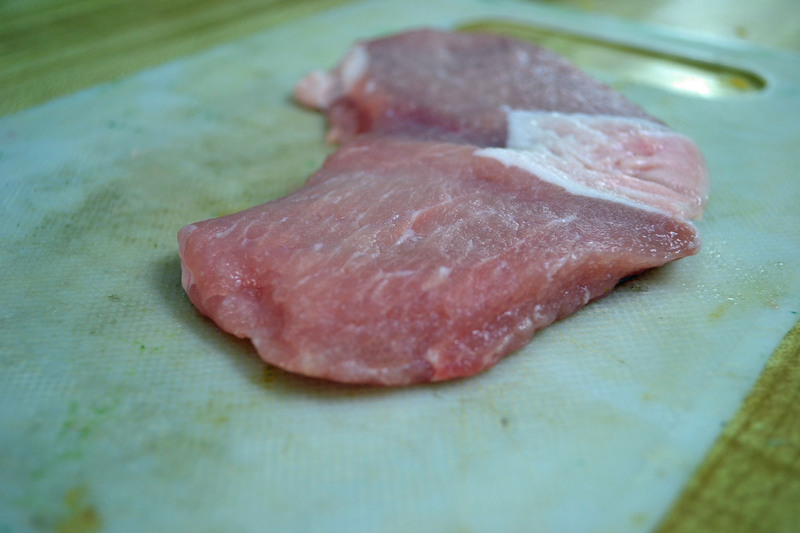 Ever since Tony had his colon cancer surgery, he is not a fan of thick pork chops – I got a package of 5 of these for only $3.68! So I had to butterfly them and pound them thin. Crap – WordPress just ate the rest of my post! And I gotta get going. Here’s a snapshot of dinner – 12 points. Supposed to be 58 degrees today – so crazy! Make it a great day! 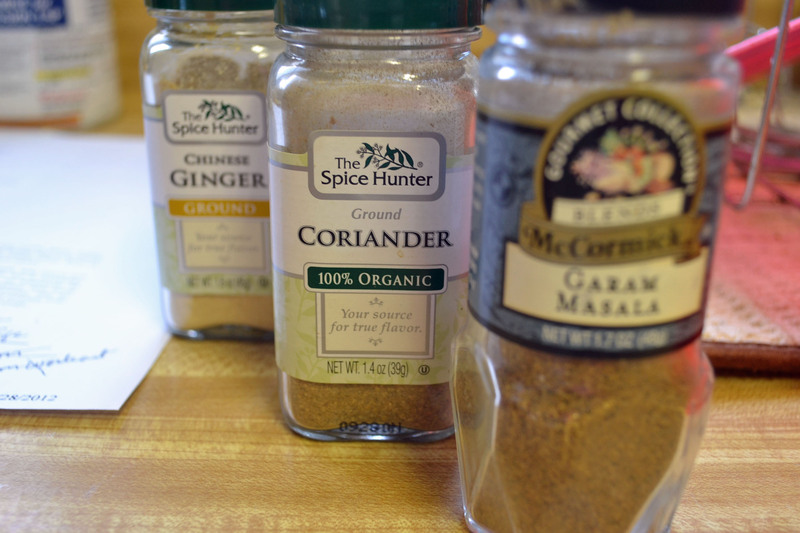 I was scared when I saw indian-spiced…I just haven’t tried it and it sort of scares me – to be fair, my mom went thru a tumeric phase where everything had tumeric in it so I am a bit gunshy. Anywhooo…I like that you left out stuff you didn’t have and I really like the looks of this soup so I am going to keep it in hand for next time I see ground chicken on sale. I joined WW again, so I will be looking for your recipes to help me! 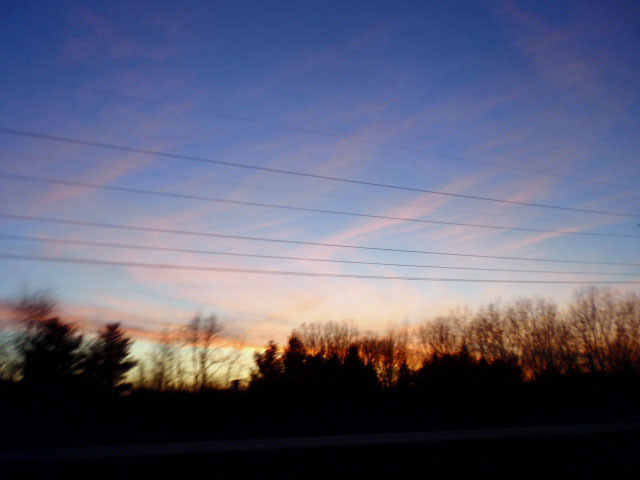 I have to admit that I’m loving this mild winter. I could deal with winters like this all the time! The soup looks awesome!! Hey Caron! I would get a food processor – I use it nearly every day – but I don’t think I spent more than 20 bucks for my stick blender – its nice to use it in the soup pot to puree soups. Definitely has become to go-to for a quick ipivnensexe quality bite. Big fan of the spicy pork w/ spicy meat naked, sandwich, or smashed. I recommend putting your name down and grabbing a drink somewhere else, the hostess will text you when your table is almost ready. This is on my menu for next week. Can’t wait. Hurray for extra snuggling! On my nights off I always contemplate getting up really early to go to the gym before my husband goes to work so I can get my workout out of the way instead of doing it later in the day, but I almost always opt for more sleep and snuggle time. We get so little time together working opposite shifts and I hate to wast what every moment we do have working out. 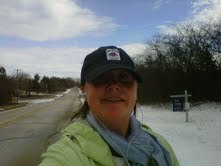 I’m afraid to jinx this weather but it has been such a joy being able to run outside in the middle of January. Can I tell you about a food memory that ridnems me of a certain place?When I was a kid we were fortunate enough to have a holiday home in the North Yorkshire Moors. We didn’t have any fresh herbs at home I don’t think they’d been invented in the 70s but at the cottage there was masses of mint growing outside by the shed. Mum used to put a few sprigs in the potatoes when they were boiling and even now, when I go into a steamy kitchen that smells of mint it takes me right back to the kitchen at the cottage. I don’t know why, but I haven’t had an english muffin in forever. Your breakfast now has me drooooooooling! This looks good and you know I’m all about the Indian spices. Just yesterday Mr. Helen asked me if I’d ever get sick of curry flavor. Um, no. We’re warmer than usual too – three cheers for that! If winter would stay like this… mostly snowless I’d be a very happy camper. That is quite a unique and delicious looking soup I must say! 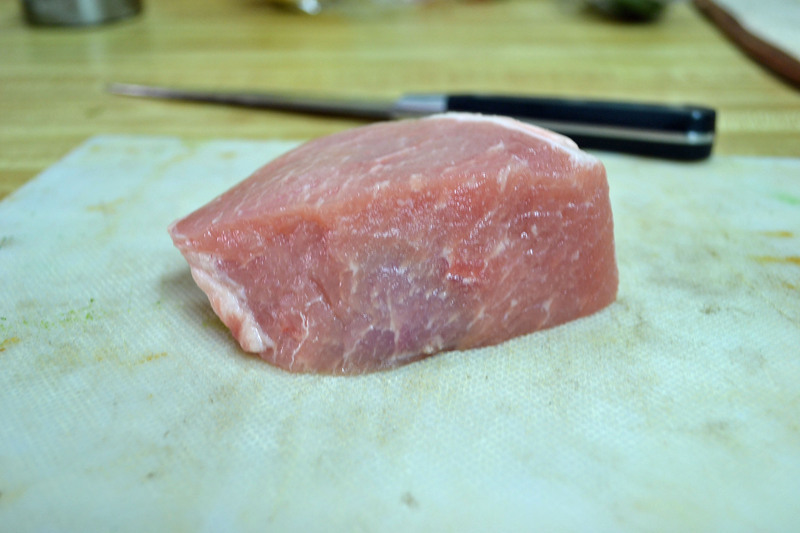 I love how you grind your own meat…I’ve never done that before. I never thought to use the food processor to grind up my own meat like that, I always figured I’d need some fancy attachment. The soup looks awesome and I love meatballs! 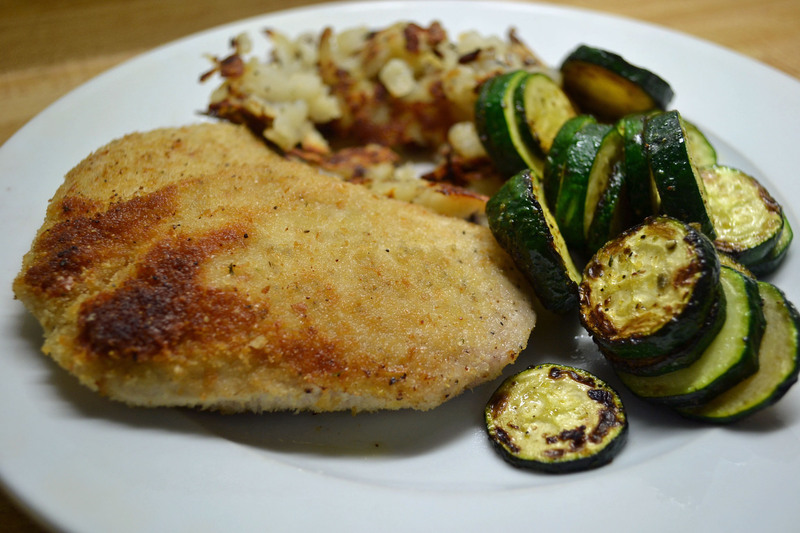 I really need to try grinding my own chicken breast, because I can’t bring myself to eat ground chicken or ground turkey from the store. It’s weird, but I just can’t. We love meatball soup here – that is a cool twist on it. We hit 66 degrees here. That is what our high is in APRIL. I have a sneaking suspicion that Feb or Mar are going to kick our a**. I miss getting off work when it’s light out. I cut my hours a bit with starting school so I get the benefit of leaving my house when it’s light out which is nice. I love reading through the spices you used-I’m sure these tasted amazing! Soup looks delicious but so does dinner. Funny is that I said to R. just yesterday that it’s longer light outside. I can finally get some walks in daylight again with Bella on a weekday. 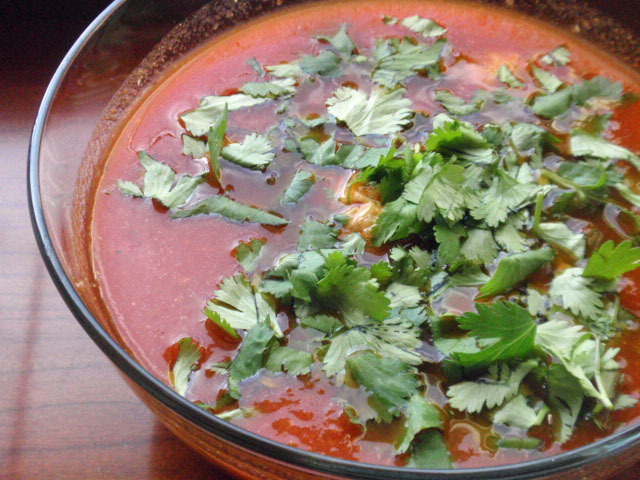 That soup just went on my list for next week! Looks delicious! That’s it. I’m moving in with y’all! Everything you make looks fabulously delicious! First of all yay for snuggle time and secondly I giggled at the crossed out no thanks for onions! I hear you on the fennel. I made Meyer lemon fennel relish and had to pitch it as it was so strong. I shall stick with seeds. Just wanted to let you know I made this soup for dinner last night and we both LOVED it!! Thanks for sharing!